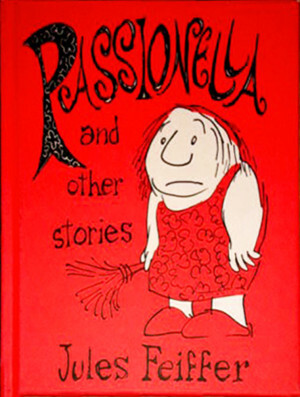 Passionella and Other Stories was created by Jules Feiffer in 1957 while he was producing his weekly strip in The Village Voice newspaper. There are four stories in this collection. 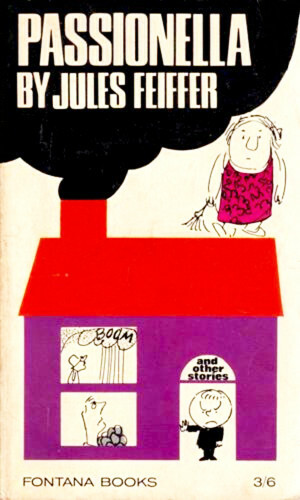 Three of them, Passionella, Munro, and Boom were published in magazines and then revised and redrawn for this book. 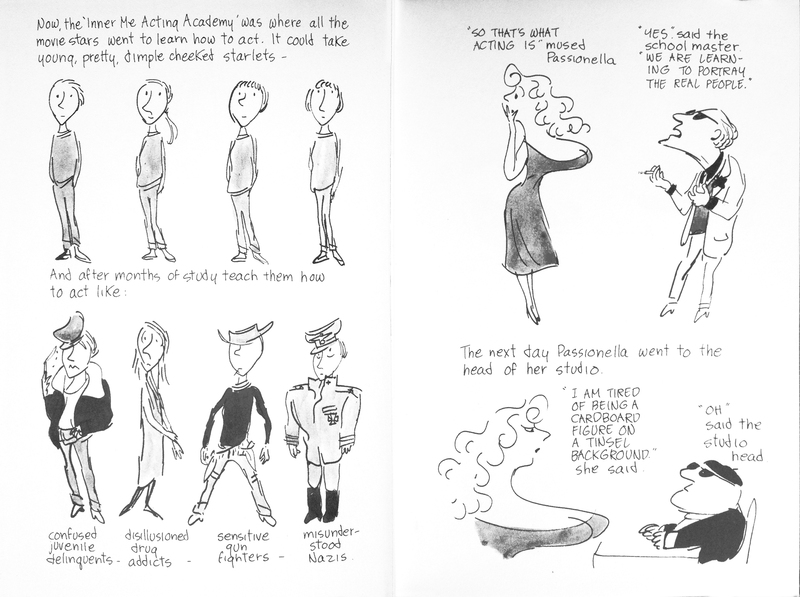 Passionella is a dowdy, thick-ankled woman called Ella, who is a very hardworking chimney sweep. After work she sits in front of her TV set and dreams about being a beautiful, glamorous movie star. One night her wish is granted, ‘plink, plank, plunk’, by her fairy godmother. There is one hitch. The nightly transformation only lasts until dawn. The ravishingly beautiful Passionella is immediately signed by a Hollywood producer. All her movies are shot at night. At 3 AM, she departs in her sports car. 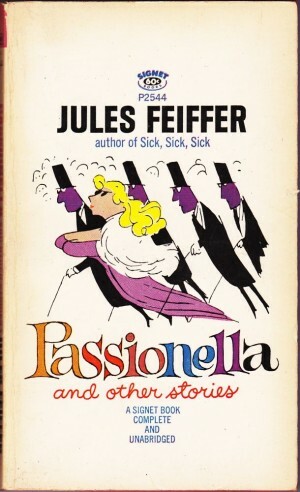 There is nothing radical about the way the story unfolds or any of Feiffer’s observations, but the dialogue is funny and the caricatures are so good that it’s very pleasurable to follow along as he jabs at celebrity and media through Passionella’s desires to be first beautiful, then successful, and finally, loved. Munro is a little boy of four who is drafted into the U.S. Army. He tries to tell everyone that he’s only four, but nobody will believe him because the army doesn’t make mistakes. “It is the official policy of the US Army not to draft men of four. Ergo you cannot be four. Ergo you only THINK you are four,” the Sergeant tells him without ever looking at him. Munro sees a doctor, a psychiatrist, a chaplain and a colonel all equally blind to the evidence of their own eyes, and their hilarious responses are also chilling in the way they very accurately convey what it feels like to challenge the dominant narrative in any organisation. These stories are structured like fables, so they are told very simply without moralising. 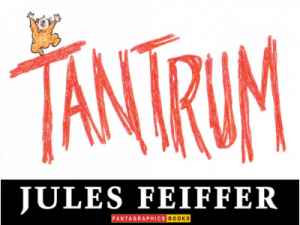 But through the depiction of the various types the protagonists encounter we are left in no doubt about what Feiffer thinks of authority and what it represents. Both Passionella and Munro’s problems are resolved in ways which fit their premises and keep the allegorical style going right to the end. 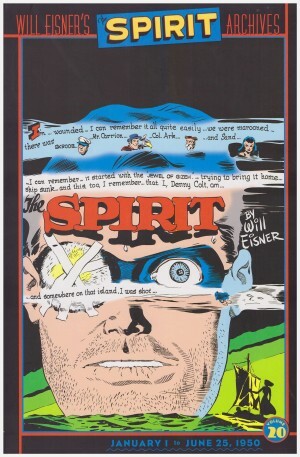 No comics historians seem to have noticed that Passionella and Other Stories fulfilled the criteria for the first graphic novel 20 years before Will Eisner. It wasn’t an obscure book that nobody had heard of, either. 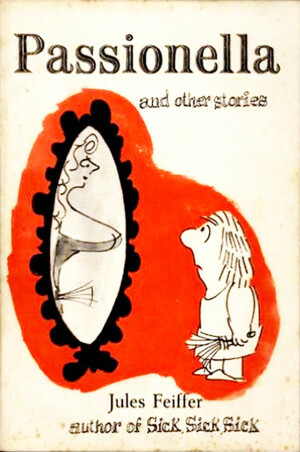 It was such a big hit that it was reprinted multiple times internationally, with Passionella adapted into a Broadway musical (The Apple Tree, directed by Mike Nichols in 1966) and Munro into an Oscar-winning animated short film (directed by Gene Deitch in 1961). 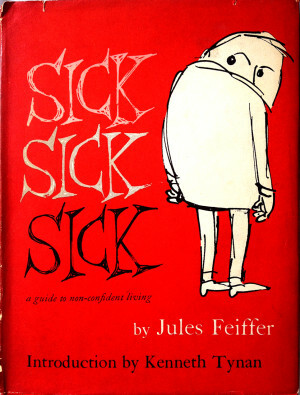 Feiffer called his books ‘cartoons’ because he had “always been thrilled to be a cartoonist, and I’m proud of it, and I like the term. I see no need to upscale the work I do with some meaningless choice of words like ‘graphic’.” Perhaps that’s why. Whatever the reason, Passionella has aged well. It’s a funny snapshot of its times and still worth reading today. Vintage copies of this book are easily found. 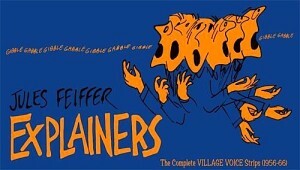 The content has also been split over newer editions titled Feiffer, the Collected Works. 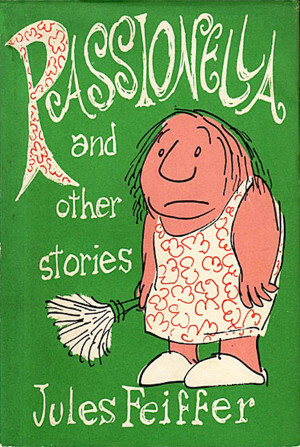 Munro was volume two in 2002, and Passionella was published in 2006.